Info "Fill the cup up to here." Tapped Out is one of Orbulon's microgames in WarioWare: Twisted! The game's purpose is to fill the cup to where the two arrows point at. 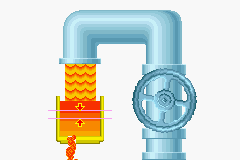 To do so, the player has to open the faucet and close it at the right timing. If done so, the game is won. However, if it gets above the upper arrow, the player will lose the game. 1st level difficulty: The arrows are close to the top. 2nd level difficulty: The arrows are close to the cup's bottom. 3rd level difficulty: The cup has a hole in its bottom. So the water will spill. This page was last edited on November 17, 2018, at 03:27.